Applicants will pay Rs 1250 Challen for Successful processing of Application Form. For entrance to Ph.D. programs, candidates should have at least 65% marks (annual system) or CGPA 3.00/4.00 (semester system) in MS/M.Phil with GRE/GAT (Subject) with minimum 60% score. All Ph.D. programmes are designed for 3 years duration comprising of coursework, seminar on a research proposal, writing a thesis on an approved topic, research seminar, evaluation of thesis by two foreign experts and defence of the thesis in a viva-vice examination. 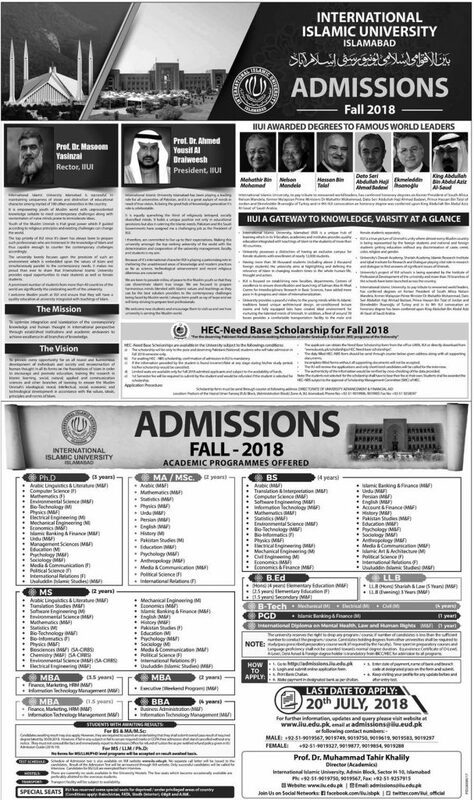 In IIUI for entrance to MS programs, candidates must have at least 60% marks or CGPA 2.50/4.00 in MA/M.Sc./BS (16 years) & GAT (General) with minimum 50% score. All MS programs are designed for the duration of 2 years comprising of course-work, research seminar, writing of the thesis on an approved topic and its defence in a viva-voice examination. Merit for entrance will be based on academic record (30%), written test (50%) and interview (20%). Candidates should have at least 50% marks or CGPA 2.00/4.00 in their bachelor’s degree. Merit for entrance will be based on academic record (30%); written test (50%) & interview (20%). Above degree programs are designed for (2 – 3.5) years comprised of course-work or thesis/dissertation on an approved topic and its defence in the viva-voce examination. For entrance to BS Programs,Candidates should have at least 50% marks in HSSC or equivalent. Merit for entrance will be based on academic record (40%) and written test (60%). All Bachelor degree programs are designed for the duration of 4-years except B.A/LL.B which is designed for 6-years duration (including one-year language program Arabic & English). Applicants awaiting results (only those who have already appeared in the exams) can also apply for admission and if they pass the entry test they shall be given provisional admission until the declaration of their respective results. Such candidates are required to fill in the undertaking that he/she will submit result within two month’s time after commencement of the semester. If he/she fails to secure required marks or CGPA, his / her admission shall be treated as cancelled immediately without any further notice and continuation of studies shall be considered Unlawful. Furthermore such candidates will not be entitled to refund of tuition fee. Applicants securing straight pass grades with required percentage only shall be eligible for continuation of studies. The absolute value of percentage is considered as final; it is not rounded off to next whole number e.g. 49.99% is considered 49.99% and NOT 50%. Schedule for admission test is available on International Islamic University Islamabad AdmissionIslamabad website www.iiu.edu.pk and No Separate call letter will be issued to any candidate. The result of the admission test will be displayed on IIU Islamabad website within five days after the date of admission test. There will be no interview for BBA/BS /LLB Degree/Diploma programs. After entry test session done by university. Student are waiting to see IIUI Merit List 2018. After selection list view there is appear then university give you admission form confirmation with Fee Structure of that program. University provide admission on best come first serve base, like early submit IIUI admission fee and get early admission. So, student be careful after selection through merit submit your semester fee quickly. For details of admission per semester follow given link and get admission in IIUI. Best of luck for your new era in life. 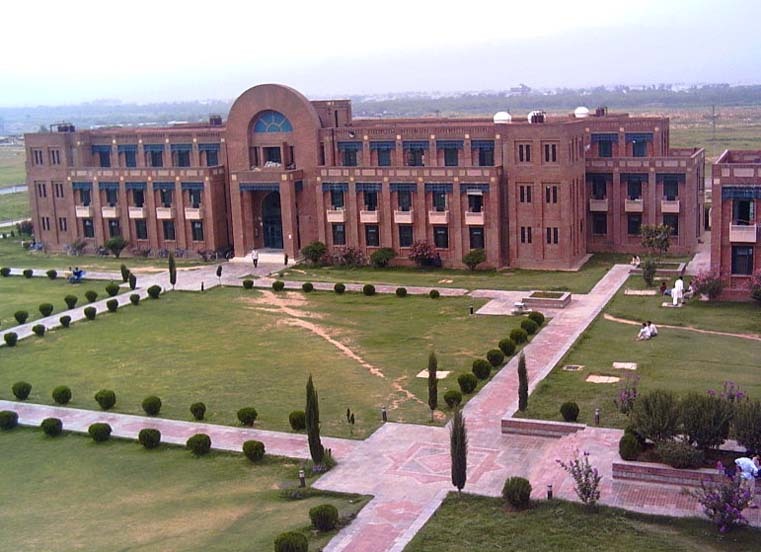 Full name of IIUI is International Islamic University, Islamabad and it is considered to be one of the top universities in Pakistan. Most fluent under its circumstances to provide quality education for the students who are currently studying in or are applying for admission in this higher Education institute. Here and now, we will portray all the academic programs in which the student can get information about programs which are offered by International Islamic University Islamabad. Furthermore they will get to know the names about the disciplines and their eligibility to apply as well. If you are looking for these kind of details which include the topics such as programs for admission in IIUI, then you have stopped your train at the right station. Kindly stay with the post and procedure because of the healthy and crucial details on this topic. These are those subjects which are mostly labeled as BS, BA, and BSc etc. when a student successfully completes his or her intermediate academic education, he or she goes into the professional life of learning or in other words a higher education counseling period. These are mainly of 4 years or 2 years programs but now a days, 4 years duration degree is more appreciated as compared to the other one. Following are the programmes which are offered by this Institution. These are the disciplines which are offered under the category of under graduate programs. Moving on towards the graduate subjects. Above mentioned are the full and final details about the subjects which are proposed by IIUI in the matters of actual educational Standards. Considering the quality of teaching, the faculty of this institution is on another level while given best results. They motivate and spark the element of hard work in the inner self of the student. Moving on towards the other details of this University. A bright student only wants a chance to fulfill his destiny on his own. Such people face extreme difficulties in surviving on their own whether in life style or education. Scholarships are the best way to ensure the financial relaxation of such students. 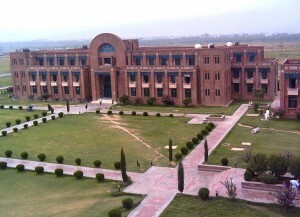 There are many facilities which are provided by IIUI and Scholarship providence is one of those facilities. If people were to make the most out of their education then having eligible for this facility would be wiser and ethical chance for them to move forward. We will provide all the names of the scholarships which are offered by this institution. Take a peak down below to know about all the different categories of this facility. Considering the quality of education. This university obliges its students in its premises by given them admission on merit. If they do not survive or come up on the merit list then they are likely to not get admitted in the International Islamic University Islamabad. For the students who survive or their name comes up on the merit list, get admitted and have to pay for the semester fee before the start of the semester. These considerations are and should be made before thinking any further. Do extreme hard work and try to work to way into the merit list and get admission, you will not regret being in this fabulous institution. Get latest updates IIUI Online Admission 2018 and entry test results. Thanks for visiting our site which is compatible for Universities Admissions and details. We provide the best information about International Islamic University Islamabad Admission 2018.
i take admission in MA ENGLISH pz guide me when admissions r open in islamic? In last weak of november admission will be open. Nosheen Mehmood you apply for admission in course which you desire for and after this university select you on merit base. sir i got 55% marks in fsc and i want to take admition in IIUI plz tell me can i get admition for bs??? Yes, you get admission in International Islamic University. If you get good marks in entry test then you easily get admission in international Islamic University. yar dobara kb open hona bs ee ka admition? You download Admission Form and apply for admissions. Dear, if you apply for MBA admission than you must have 14 year education or 16 year education. If you diploma is equivalent to BBA/BSc than you apply for admissions. Dear, Qasim this semi-government university partnership of Pak Government and Saudia Government. LAST YEAR merit of Mechanical Engineering is not confirmed yet. No, MBBS is not offered by International Islamic University. Sir kindly tell me about the eligibility and fee structure for bs software engineering ? You must have 50% marks in Fsc for admission in Software Engineering. sir bs civil nd other department forms are same or not plzz tell me? The Form available on the official website is for Civil Engineering. You must have 50% marks in FSc/ FA for admission in BBA. You get admission form and apply for admission in IIU Islamabad. Last Date of Form submission 15-07-2014. Yes, asad you get admission in IIU ISlamabad on the these marks. Your marks are too good. 16 years degree in Economics / Finance with minimum CGPA 2.50/4.00 or 60% marks. Entry Test for MS Economics 2 years	Male & Female	11.08.14 at 01:00 p.m.
sir i have got 75% marks in B.sc, can i got admission in M.sc chemistry? and plz guide me about fees structure?? Dear, Zeeshan M.Sc Chemistry is not offered by IIU ISlamabad. plzz kindly tell me when admission are open for MBA fianance ?? Yes, admission are open for MBA Finance. You apply for admission till 15 July. sir tell me about m.phill admissions date and also tell me that now GAT is requied for m.phill or not???? on 23rd march Lahore high court announced that GAT is not required for govt. universities…. M.Phil course is not offered by IIU Islamabad. It only offered MS and Ph.D Porgrams. is m.phill psychology or M.S psychology is the same category?? and is the course is m.s psychology or m.phill psychology??? M.Phil in Psychology is not same with MS Psychology. For admission in M.Phil in Psychology you must have 16 year education. For admission in MS Psychology you must have 14 year education. So, there is big difference between these two degree these are not same. sir i live in lahore but kya me application form through tcs send karwana parega ye mujhey islamabad ana parega. Dear, Zohaib you sent applicant form thoruhg TCS. Yes, tayyab you get admission in LLB 5 Year if you get good marks in entry test above 65% then you easily get admission in LLB. Your LLB entry should be simple not too much difficult to attempt. Entry test should be concern for previous degree. Sir mai ne B.A kea Lea admision Lena tha procedure bata dain plzzzz. Dear, Shahzad IIU Islamabad not offered BA. Dear, you must score 75% marks in NAT-IE for admission in BS Mechanical Engineering. Your form should reach on 15th June till 03:00 PM. So, if TCS will give you confirmation that your form is reach on 15th July then you go for TCS process. Apart from this you come to the university and apply for admissions. When i get your answer kindly inform me too. Yes, you get admission in Software Engineering. If you get good score in entry test then you easily get admission in Software Engineering. 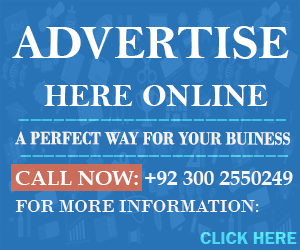 You must have 50% marks in BA/B.Sc/B.Com 14 year education. Every year merit is different so I have not give you exact figure. If you have 70% marks in entry test then you easily get admission in MBA Finance. Tomorrow you come to the university for submission of admission form. sir kia ab add hosakta hay??? New Admission will announced in Dec/Jan. When admission announced then we have updated on the website. B.Com is not offered by International Islamic University. and also Tell me the date of test. The best books are your FA/FSC books. If you extract good concept form these books then you easily pass the entry test. sir i got 829 marks in f.sc now i want to take admission in ba llb in iiui can i able to get admission??? Yes, dear you get admission in BA LLB. If you get good marks in entry test then you easily get admission in BA LLB. I have answer your questions. Plz check you comment either you insert on the webpage. sir i got 83% marks in matric and 76% in fsc part1 how many marks are requied in entry test to get admission for bs mechanical engeenering? You must score 80% marks in entry test for admissions in Mechanical Engineering. jamiat walo ki classes kb lgy gi entry test ki tyari karwany k liye? Sir em able to get admision on merit instead of self base?? Sir plz tell I am able to get admission in software engineering on merit instead of self base.? All admission in IIU Isalamabad is on merit base their not criteria of self base admission in University for Software Engineering. Sir ma ne admmsin lena hai kia kro. . . . Fsc mein 50% n0 ajye gy. .
You want to apply for which course in IUUI. Sir I want to ask about MA english test.when is MA english test and can u plzz guide me about test. Entry Test for MA English should be held on 12.08.14 at 10:00 a.m. Test should be simple. Plz ye bata dain k entry test previous classes k syllabus se aata hai ya k kesi or book se tayyari karni parti hai..
For appearing in the entry test you must prepare your intermediate books only. Your intermediate books are best for you to prepare for the entry test. plz kindly tell me about entry test.Sir mein nay bs comp sci k liye apply kia hai. plz ye bata dain k entry test previous classes k syllabus ssy aata hai ya kesi or book say tayyari karni parti hai.. Yes, you eligible to apply for BS Psychology Admission in International Islamic university. But admission are closed now for Fall. sir bs biotechnology k admissions kb tk open hon gy??????? New Admission should be announced in springs. Fall Admission are closed now. This is right date of civil engineering which is mentioned in advertisement. sir may i take admission in islamic uni im master on the base of NAT2 test .. as this uni is associated with NTS? Those entry which held on 12, 13,14, 15,16 should cancelled and new dated should announced later. sir I have not appeared in any NTS test. Can I apply for civil engg. IF I can then what r the reqirements……. Yes, you apply for Civil Engineering Admissions. You must have 60% marks in FSC Pre-Engineering. Currently, admission are closed for BS Hons. Your are too late now. You get admission Form from official Website of International Islamic University. When result announced for BS Eletronics then we have upated on the website all entry test date should be extended to 20 Aug.
Test date again delay to nahi hn gi na? I want to take admission in msc economics .I have obtain 63% marks in b.com can i eligilible for admission if yes please tell me fee structure..
For Admission in MS Economics you must have 16 years degree in Economics / Finance with minimum CGPA 2.50/4.00 or 60% marks. Admission for MBA should be closed now. sir mujy ap ki uni mai software engineering mai admission lena hai plzzzzzzzz mujy btaen ky ap ki uni mai 2nd entry test kb ho ga r last date form submit krwany ki kya hai??? ?r ap ki uni ki fee kya hai?????? New Admission should be expected in the month of Jan/Feb. You wait for spring admission announced by IIU. nd last dat of form submission …. Admission will be closed for LLB. Is ba llb offer in spring? If University offered this course then we have updated on the website. Yes, you apply for admission in International Islamic University but currently admission are closed. whether these programs are offered in ur university? if so, what is admission criteria and fee structure? University offered LL.M Shariah (Islamic Commercial Law). Secondly admission will be closed now. When new admission announced then we have updated on the website. sir mery fsc me 56% marks ha.. me iiui k entry test me kitny marks lo to mujay civil engineering me admission mil jay ga? Dear, if you get 80% marks in Entry Test then it may be better chance for you to get admission in International Islamic University. Sr i want to take admission in tefl deploma. plz tel that is gat twst is necessary for admission in Tefl? University not offered PGD TEFL. please mje ye pta krwa den k m.phill in statistics k liye gat require hai ya university ka apna test ho ga??? This university not offered M.Phil in Statistic. University offered M.Sc in Statistic. Secondly GAT Test is compulsory for MS Programs. Sir can you please tell me when are the admissions going to open for BS. Hons in psychology in IIU? New Admission will be offered in the month of Nov/DEC. When spring admission announced then we have updated on the website. when admissions of mba open in islamic? Currently, spring admission are not announced when spring admission are announced then we have updated on the website. sir civil engr maye late admission ho sakta ha kia abi?? No, admission will be closed now. do they offer bs microbiology??? BS Microbiology is not offered by International University. sir kia yeah bsbioinformatic programe offer kar raha hai??? if yes what is fee structure? and what kind of programe it offer? BS Environmental Science is offered by IIU for Pre-Medical Students. Currently, spring admission are not announced in International Islamic University. sir when admison r anouced? sir kindly tell me about fee structure of bs in english n when admisssions will open? Admission will start and last date of form submission is 26 Dec. Fee Structure will be mentioned in the university website. Aoa sir..i want to get admission in ms.c mathematics…is there opportunity 4 girlzz to apply in maths?? ?kindly plz tell me bcoz I hvn’t seen in ad…if not then why?? Females will not apply for M.Sc Mathematics. Sir… Mai NE BBA k liye apply karna hai iiui Mai… Mery matric Mai 926 and fsc Mai 856 marks thy…. ! Kitne chances hain mera hojaye GA yaha??? You have much better chances of admission in BBA. You will apply for admissions till 26 DEC.
Are admission for MA international relations is open ? I can’t find it. What is the criteria? This university offered MS in International Relations. MA/BS-(4 years) Political Sciences / International Relations / Defense & Strategic Studies with CGPA 2.50/4.00 or 60% marks in annual system. You will download admission form and pay bank draft then sent it to the unviersity. Complete address and detail should be mentioned in the website. sir kia is university me bs chemistry k b admission open hain? No, university not offered BS Chemistry. are there is also a MS in statistics? No, this program is not offered by Intentional Islamic University in springs. Dear, Ali you want to apply for which program in International Islamic University. AOA! Can you plz tell me the daily timings to submit the admission form? I am going to apply for MS but due to job i have to take out the time to submit a form. You will submit admission form till 04:00 PM. Thanks alot! today i visited university and found that university is closed till 28th. the last date for submission of forms is 26th. now my concern is whether univ will extend the date or not? if you have any info plz do let me know. Yes, it is possible if you go for add Math Subject. Fall Admission should be start in the month of July/Aug. sir plzz infm me can I take admition in ur uni for MSC chemistry?? I got 87% in bsc..
Msc Chemistry is not offered by International Islamic University. BS IT is not offered by International Islamic University. You must have 50% marks in Fsc for getting admission in International Islamic University. Fee structure is updated on the website. You check here a detailed fee structure. New Admission announced in the month of July/Aug. sir mary matric ma72% or ics 55% marks kay mujay bscs ma admission mil gay ga? Yes, Wasif you will eligible to apply in IIU Islamabad. You need to score good marks in entry test and get admission in BSCS. i want to take admission in International Islamic University for M.Phil economics guide me plz & kindly tell me when admission are open. New Admission will announced in the month of June/ July. When admission announced than we have updated on the website. sir i want to know that can i get admission at islamic university on nat nts test basis if yes then how much percent marks i would have get in nat for bs electronics.i have got 69% in fsc . You need to get minimum 70% marks in entry test for getting strong position in merit. Sir I want to take Admission in M.Phil . SO Would I have to pass a GAT or IELTS Test. OR the university will take the departmental entry test. I want to ask one more thing can apply for two programs at a time. University conduct his own entry test for MS Programs which is equivalent to M.Phil. Secondly, information regarding you apply for two program will get from admission cell of Intentional Islamic University. Admission Test schedule will be display on the website. sir i want to take admission in BBA please bta dan k admissions kb sa start ho rahay ha or last date kia ha.. Admission starts from 25th May till 30th June. Sir, I want to take admission in L.L.B Hons. I’ve given papers of intermediate part 2. I’ve got 415 marks in part 1. Will you Pleas tell me the process of taking admission and date of admission. Waiting for your reply. Admission start from 25th May. You can apply through download admission form from official webpage of International Islamic University. sir kia BA mai 49.7 % marks secure kerney walon ko 50% ki requirement waley programme mai admission mil sakta h?? I want to join Mphil English . Please provide me the details . When admmissions will be started and what will be the criteria / Fee structure .Timings of the class . Eligibility: MA/BS-(4 years) (English) with minimum CGPA 2.50/4.00 or 50% marks in annual system. Admission start from 25th May and open till 30th June. You get admission form from official webpage of International Islamic University. plz tell me hope certificate is required for result waiting stdnt? Yes, hope certificate is compulsory for admission International Islamic University. You can just appear in University entry test conducted for MSc Mathematics. Schedule of entry test should be updated on the website. form HBL ki ksi b branch ma submit krva sakta hn ya nhe??? test kis date ko h?n form submission ki last date kya h? form HBL ki ksi b branch ma submt krva sakta hn ya nhe? test kis date ko h?…form submission ki last date kya h? Sir May Engineering may Adm laena chahta hoen .. so entry test ki last date konsi hy ..
i want to take admission in bs maths but it is not offered for females what should i do?…. Aneesa wait for IIUI Fall Admission 2018. BS Maths in International Islamic University offered for females in Fall admission 2018. IIUI fall admission are coming in the month of JUNE/JULY. Is BDS offered by islamic university ? if not then why..
BDS is not offered by IIUI. Because Islamic university no medical college currently in future Medical college will be establish. Sir, recently I give my BA exams and want to get admission in MBA HR,can you plz tell my how to get admission in IUII. Recently no admission are open in Islamic University Islamabad. Hopefully IIUI admissions 2018 will be open in June/July. AOA!Sir Bs Physics main admission lainy ki last date kiya ha?or test kis date ko conduct ho ga?Sir plz inform me about this. Go to http://admission.iiu.edu.pk/ and sign up apply online admission for both degrees and at last print challan form to submit fee on Bank. Sir mein Iss University mein admission Lena chahti thi..but mene aaj dekha to last date 20 July mentioned hai..plzz tareeka bta den k ab mein admission kesy lon? ?